Are your middle schoolers (or dare I say high schoolers) still writing run-on sentences? If so, chances are they don’t recognize independent or dependent clauses. They will, however, after they finish this kinesthetic Maze. I love to let students move around when they learn, but I Do NOT love the loud and off task behavior that can come with kinesthetic learning. So here is a kinesthetic lesson without the "Krazy." (Krazy = the potential for any of the following classroom management problems: opting out, letting others do all the work, loud and/or off task behavior, and having more fun than learning.) There is no krazy in The Maze! Before going into this Maze, I begin with my whiteboard lesson on Independent vs. 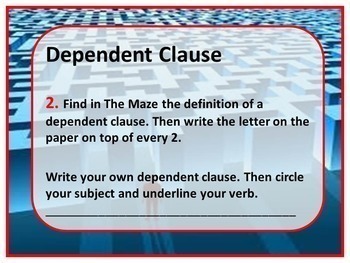 Dependent clauses.) 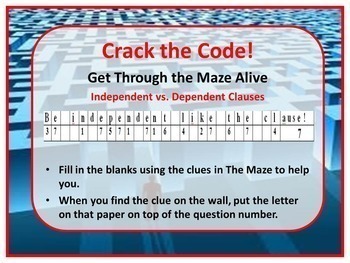 But if your students have some background knowledge on clauses, you can try sending them out into The Maze to see if they survive. *This product is a zipped folder with PDF documents. *The product is fully editable so you can change wording (i.e. 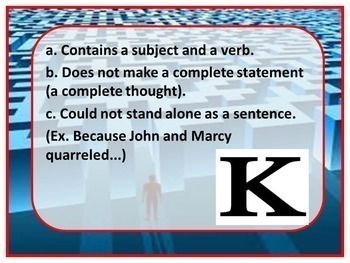 dependent vs. subordinate clause, class vs. period, etc.). What is The Maze you ask? I normally set up The Maze in the hallway, and students have to crack a code by finding clues on papers taped to the wall. Please note: this is NOT a real maze. The Maze is in their imaginations. In reality, they are in a much scarier place: a middle school hallway. 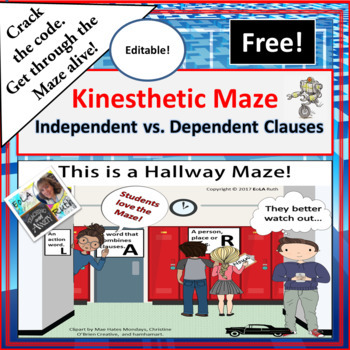 This is only one of the many kinesthetic Maze lessons I’ve created to motivate middle schoolers. Give The Maze a try. Your students will thank you for it. p.s. The first time you run a Maze it can seem intimidating. But the motivational and educational benefits of it are worth the learning curve. I promise. Please Click Here for my Blog Post on How to Run a Maze.